Efficient use and production of energy is a relevant factor for a green economy. 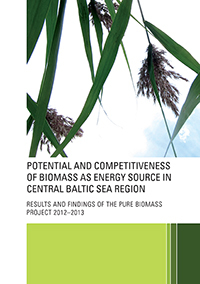 Sustainable use of energy resources has significant effects on the development and preservation of the Central Baltic Sea Region environment in the next decades and centuries. Diverse use of biomass in energy production is important for increasing the energy supply to meet our growing demands and solving our local, regional and global environmental challenges. The objective of the Pure Biomass project was to build public understanding about the benefits of using biomass for energy production. Project activities were based on studies of biomass availability, technical-economic aspects and environmental protection. The results can be used to promote the technical and economic benefits of the use of different types of biomass feedstock in energy production in the project focus areas. This publication offers the main results of the multinational Pure Biomass project in the form of articles written by experts in their own fields. The publication consists of studies conducted during the project and will reveal the experiences gained within and also outside the project network.